On the 15th of October 1964 the Deccan College celebrates the centenary of its main Building, and curiously enough this period coincides with the Silver Jubilee of the Postgraduate and Research Institute which, as successor to the Deccan College started functioning from 17th August 1939 when members of the teaching faculty reported on duty. When I suggested to members of our faculty the novel idea that the centenary should be celebrated by the publication of a hundred monographs representing the research carried on under the auspices of the Deccan College in its several departments, they readily accepted the suggestion. These contributions are from present and past faculty members and research scholars of the Deccan College, giving a cross-section of the manifold research that it has sponsored during the past twenty-five years. From small beginnings in 1939 the Deccan College has now grown into a well developed and developing Research Institute and become a national centre in so far as Linguistics, Archaeology and Ancient Indian History, and Anthropology and Sociology are concerned. Its international status is attested by the location of the Indian Institute of German Studies (jointly sponsored by Deccan College and the Goethe Institute of Munich), the American Institute of Indian Studies and a branch of the Ecole Francaise d’Extreme-Orient in the campus of the Deccan College. The century of monographs not only symbolises the centenary of the original building and the silver jubilee of the Research Institute, but also the new spirit of critical enquiry and the promise of more to come. The present monograph has a distinct goal. It lays stress on the problem of structure in speech. 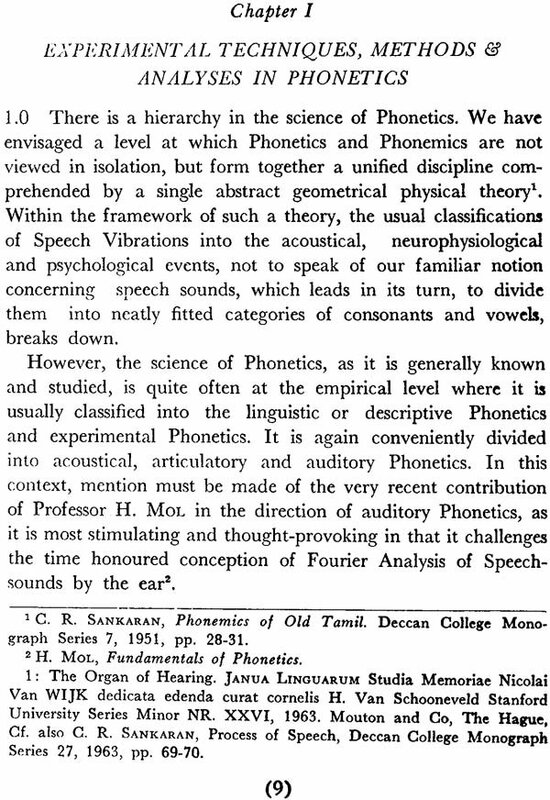 Towards this goal the various types of techniques, methods and analyses in vogue in the field of phonetics are first studied in the introductory chapter. The author of the second chapter "The Anatomy of Speech Apparatus" is Professor Leon henri strong now of the Department of Anatomy and Cardiovascular Research at the Chicago Medical School, and formerly faculty member of University of Michigan Medical School. He was the first to lift anatomy out of general medical anatomy and to specialize it in voice science and biolinguistics. Dr.Strong has contributed studies on the functions of the larynx and has worked on the finer structures and functions of the tongue - a study of far- reaching importance to prosthetists, linguists and speech therapists. After becoming emeritus professor some years ago, now in his 77th year he is under contract with the U.S. Government in connection with a work in embryonic blood vessel development, as his studies have been in the field of patterns of development of embryonic internal blood-vessels of the central nervous system since his leaving the University of Michigan in 1947. With the handicap of a bad health in his advanced age as he is suffering from lymphocetic leukemia and with his fresh commitment too to the National Institute of Health for a period of two years after 1965, he still hopes to get back to further investigations into the vocal apparatus. I am deeply indebted to him for his generous consent to have his name associated with me as joint-author of this monograph. A free exchange with me of his fruitful ideas in his highly specialized field has led me on to seek the connecting link between his significant investigations into the anatomy the vocal apparatus and my own investigations into the problem of structure in speech. His contributions in the second chapter of this monograph will, it is hoped, lead to various interesting suggestions towards establishing such a link. This is all the more so as even his comparatively recent and a very noteworthy contribution on "Muscle Fibers of the Tongue Functional in Consonant Production"" has not been paid the attention it so richly deserves, from speech-scientists for the last one decade. As early as in 1935, Professor Strong had presented an analysis based upon the only earlier histologic study in the literature of the microfibers of the vocalis muscle, namely, that of Jacobson of St. Petersberg in 1887. Professor Strong used Jacobson's framework of fibers on a theoretical basis, in combination with his own physiological gross anatomical study, as he has described it in his very recent letter of April 15, 1965 to me. 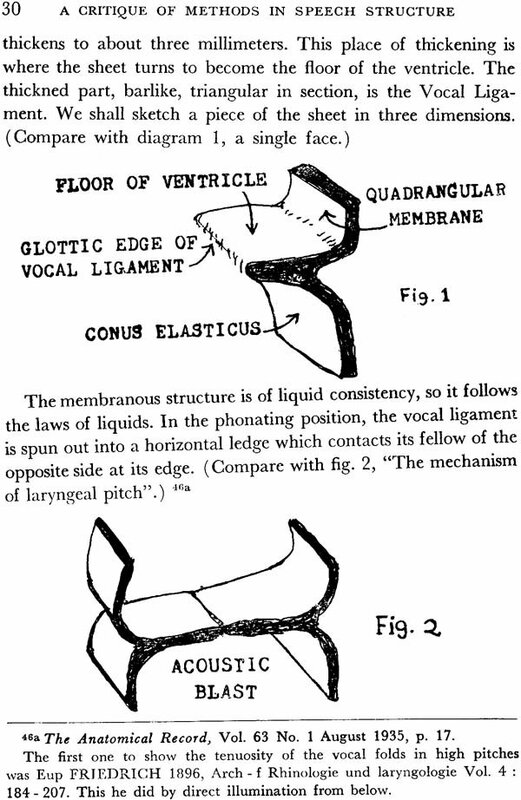 Professor Strong's contributions to the theory of Voice Physiology are (1) that in a system in which the vibrating structure is a membrane, whose elastic limit exceeds its ultimate strength, no amount of linear tension would change its pitch. For, pitch change accompanies progressive molecular strain. Since such a strain does not occur in the vocal ligament when stretched, no resulting pitch change occurs, and (2) that the forces operating in pitch change on the vocal ligament were of micro-order in modulation, and that they act lateral and perpendicular to the axis of the vocal ligament. They would thereby lessen the medial pressure at any point or region so that the air would meet less impedance than elsewhere along the vocal ligament. Thus, it would force a valve through the vocal folds of definite length which would vibrate at a definite number of cycles. In 1938, Professor Strong fixed less than 18 hours after death a larynx taken from a throat cut. The sections were cut parallel to the ventricular surface of the vocal ligament. Observations of this new material led Professor Strong to examine a series of sections cull frontally (at a right angle to the former sections). Thus Professor Strong had the vocal lip in three dimensions. The upshot was that his original theoretical (1935) schema proved to be more involved than need be to explain the mechanism. In 1940, Professor Strong again, therefore, presented a paper covering his newer observation at the Meeting of the American Association of Anatomists. This paper was printed as an abstract in the Anatomical Record, Vol. 76, No. 2, pp. 53-54. This abstract is now being published for the first time in our present monograph (in section 8.0) as originally Professor Strong had written it. We are also publishing in section 9.0 the joint contribution of Professor Strong and Dr. Ernest M. Gold. The summation of Professor Strong's views since 1950 to date should be of interest to phoneticians. The two photographs (diagrams 1 and 2 in section 6.0 of our present Monograph facing pages 28 and 29 respectively) show us the sections through the larynx. Professor Strong's investigations to determine the mechanism of laryngeal pitch led him to depart from the well known theory of pitch production, namely, linear tension which was first held by Ferrein in 1741, later mobified by J. Muller in 1839 and further elaborated by Helmholtz in 1862. In his earlier studies, Professor Strong had worked with frontal sections of ordinary cadaver material. 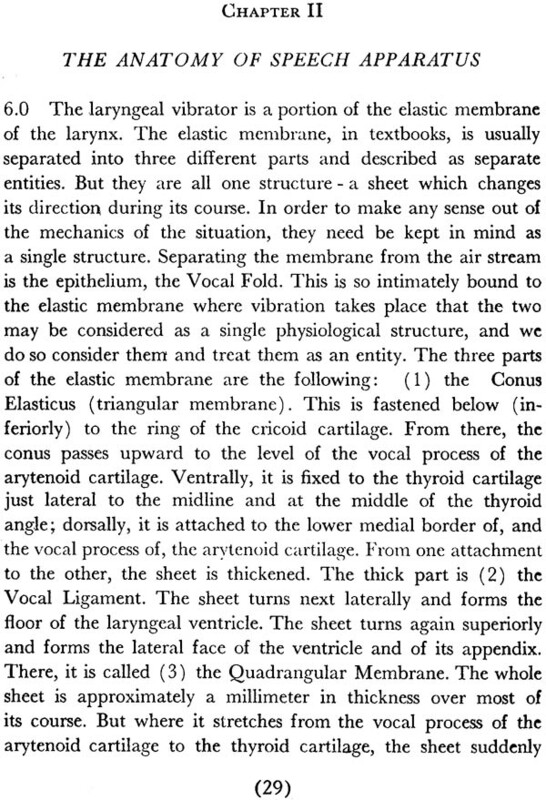 Jacobson's anatomical study of the vocal lip did not show any difference from the interpretation Professor Strong gave of the material which he had studied. No further studies were in the literature (from the time of Jacobson's study to the time of Professor Strong's), which illustrated different relations from those shown by Jacobson. Indeed most accounts accorded with his conclusions. Professor Strong had also assumed them well founded. But later, Professor Strong's studies uncovered evidence which forced him to disavow them. Although Professor Strong had arrived at the correct theoretical explanation of pitch modulation at that time, he apparently erred (in his own words) in stating the precise manner of its function. He had assumed a more complex set of movements than his later studies disclosed to be warranted. Subsequently, Professor Strong was fortunate in getting some freshly preserved human material from a throat-cut case. Transverse sections of this material permitted Professor Strong to view the microscopic relations in a third dimension which he had lacked earlier. The investigation of pitch led Professor Strong also to consider the physical factor encountered in his anatomical studies. He found that there was almost nothing known about the properties of living membranes as regards their vibration. This led him to make the discovery that fully elastic membranes, like the vocal ligament, do not rise in pitch when under linear tension. Professor Strong's observation of the fact that, in straccato singing and in the trill, each half or whole tone is isolated from the tone before' and after it, with no glissando, (that is no intermediate frequencies audible) led him to the suggestion of a mechanism for modulation of pitch other than that of linear tension. Linear tension would furnish intermediate frequencies. The isolation of succeeding pitches indicated a fretting type of function. Professor Strong had found evidence for this view in the "throat-cut" materials referred to above. This material may be' considered as close to living membrane as it is possible to prepare. From section 6.2 upto section 7.4 in this .Monograph, we present what Professor Strong calls as-his "1955 Summary". 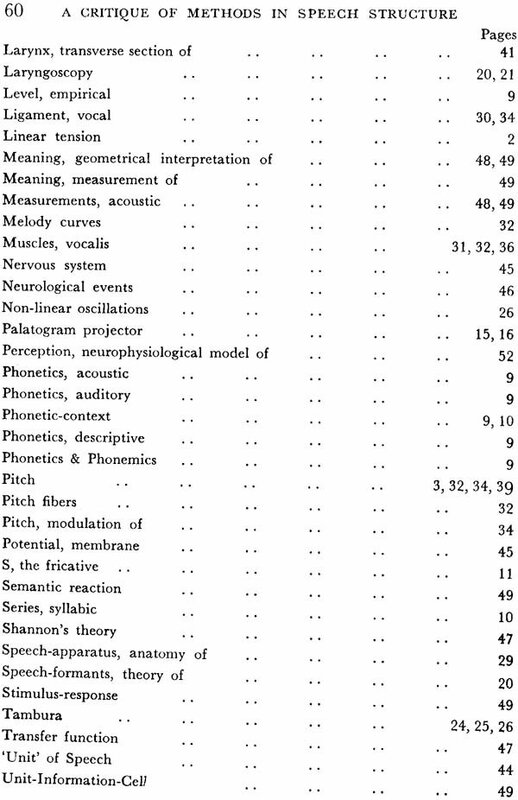 The third chapter presented here is a revised form of my paper "The Determination of the ultimate 'Unit’ of Speech" which was communicated by Professor Dr."Ing fritz winckel (Technische Universitat, Berlin) to Phonetica. 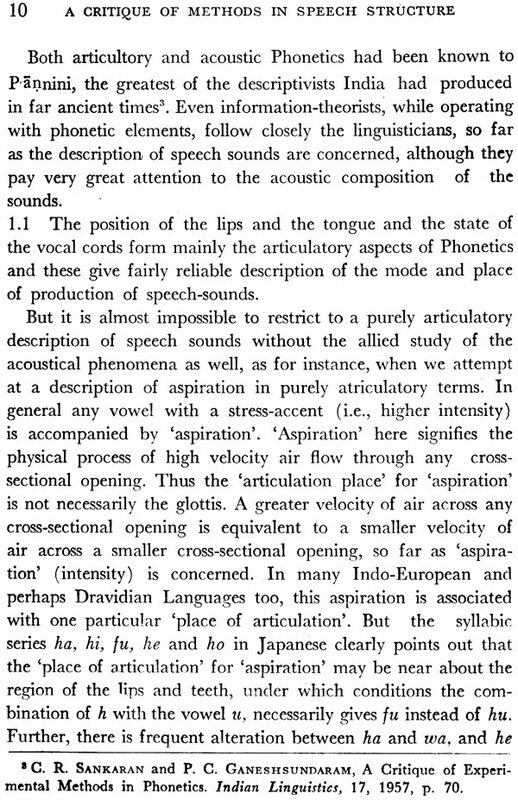 The first introductory chapter points out that acoustico-articulatory 'events' are really only 'instant-entities', and that each acoustico-articulatory 'event' in the last analysis constitutes a type of regularity which, in a deeper sense of the term, is ultimate and non-causal. The second chapter points out that Linear tension would furnish intermediate frequencies and that the isolation of succeeding pitches indicates a fretting type of function. The third chapter indicates an experimental approach towards the mote direct' determination of the ultimate 'Unit' of speech - the alpha-phonoid. This is in addition to the two already' existing suggestions towards the indirect determination of the ultimate 'Unit' of speech. It is contended that significant experimental investigations within the frame of reference of Neurophysiology would offer evidence for the' acceptance of the alpha-phonoid as a physical entity. 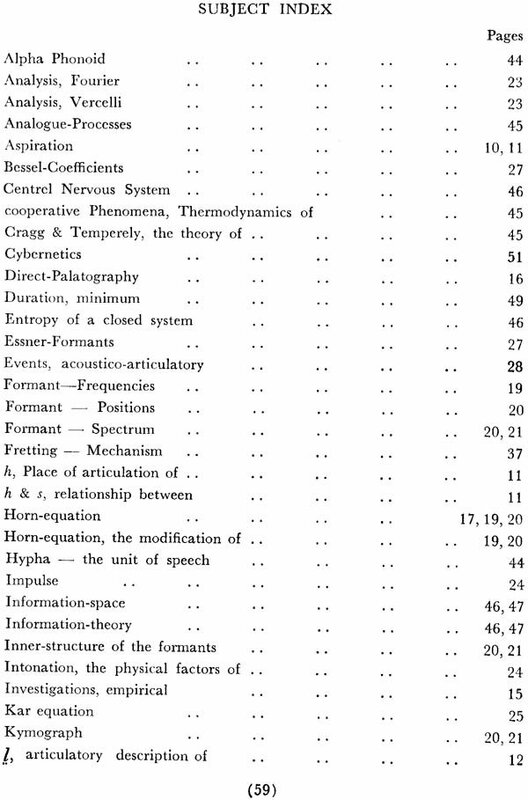 Though not in itself a piece of experimental investigation, the chapter clearly points out the present concepts in Neurophysics so that newer techniques could be evolved within the perspectives opened by our own Theoretical Studies relating to Structure in Speech and Structure in Perception. It is suggested that the determination of the ultimate 'Unit' of speech, through what is at present a purely theoretical or rather thought-experiment, would give a physical significance to the mathematical concept of the continuum due to Veronese. Finally, three lines of newer neurophysiological investigations and a few experiments are referred to in conclusion, demonstrating thereby the unified allegory of several disciplines. Motilal Banarsidas Publishers Pvt. Ltd.
Munshiram Manoharlal Publishers Pvt. Ltd.